Arieses are born at the height of spring! Aries is a Fire sign and Arieses are born under the influence of the planet Mars. 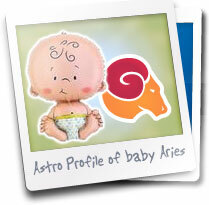 Arieses babies are intrepid, dynamic, inveterate gamblers and full of energy. They delight those around them with their physical and intellectual skills which just keep on growing. Indefatigable, Aries babies do not hesitate to take risks. They will therefore need to be watched closely and attention paid to their every action and gesture! They prefer discovering the world to their colourful and soothing play mat! So your life will be in the great outdoors, on endless walks and journeys to � other countries � by tricycle. These activities will be a very good opportunity for them to channel their dynamic energy and let off steam. They are unafraid of danger, so watch out, dear parents, and be vigilant! Arieses babies can sometimes be quick-tempered, if you dare to show resistance to their natural charisma. They will not hesitate to make their presence felt by expressing their feelings loudly and clearly! In that case, then, you need to make sure you do not give in to their merest whims, but let them cry on. That way they will learn where their limits are and you will show them that they are not always the ones who make the decisions. They are very appealing babies, who like planning surprises and do it very well. They are full of charm and will know how to make themselves irresistible! Learn more about the Aries rising sign. Arieses babies have little patience, so show them how to develop this. For example, from a very young age, encourage their desire to finish what they have started, puzzles, drawing, building things� If you teach them to control their impatience, you will enable them to give of their best. You will be able to do this by setting an example of quiet strength to deal with temporary frustration. Social life : Being the leader!